Fridgefiltersonline specialises in supplying replacement fridge water filters for genuine American and American style fridge freezers. Our aim is to provide a fast, efficient and reliable filter replacement service to our customers at a competitive price, across the UK. We are completely dedicated to your total satisfaction. Fridgefiltersonline was established to service the increasing need for expertise in the American domestic appliance sector. We have close connections with our partners, Premium Repairs, a dedicated team of refrigeration and laundry engineers with over 20 years experience between them, working with American appliances. If you have a problem with your American fridge freezer, laundry appliance or need a service visit, go to www.maytagrepairs.co.uk, to find out more. 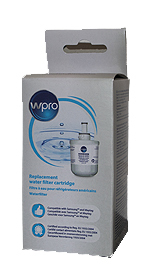 Every water filter we sell is brand new and sealed in the manufacturer's packaging. We keep all fridge water filters in stock ready for immediate shipment. In addition to replacement fridge water filters we sell accessories such as Affresh stainless steel wipes and spray cleaners, SteelKleen Eziwipes, Microban antibacterial filters, Affresh high efficiency washer cleaner, Affresh dishwasher cleaner, Glisten dishwasher cleaners and microfibre cleaning cloths.